Created by notable designer Jake Barney, the Wismec CB-60 Kit with AMOR NS-2300 Tank is a compact, powerful box mod designed specifically for use with high-nicotine e-juices and nic salts. In the Kit, you'll find the Wismec CB-60 Box Mod, the Wismec AMOR NS Sub-Ohm Tank, two WS03 MTL heads, a USB cable and a set of spare parts, giving you everything you need to vape. Sub-ohm vaping doesn't have to mean hauling a huge, heavy unit with the Wismec CB-60 Box Mod. Measuring 22.6 millimeters by 36.9 millimeters by 75.9 millimeters in size, the box mod fits easily in your pocket and in your hand. 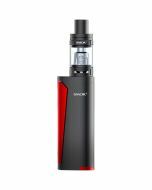 You can quickly set the vape for a power output of up to 60 watts using the up and down arrows. A .91-inch OLED screen gives you quick insight into performance. With the Wismec CB-60 Box Mod, you can vape with confidence, knowing that your vapor will be flavorful hit after hit. The box mod features advanced temperature control technology to provide an excellent taste experience. In addition, the temperature control reduces the risk of overheating that can shorten the life of your vape. An on-board 2300 mAH battery powers the Wismec CB-60 Box Mod, giving you the ability to vape for hours on end. Recharging is quick and simple with the included USB cable that you can plug into an AC adapter or your computer. The Wismec CB-60 Box Mod features a dual-circuitry system to ensure a safe vaping experience. With the double circuitry, there is little risk of damage due to overcharging, over discharging or high currents. Included with the Wismec CB-60 Box Mod are two Wismec MS03 MTL 1.5ohm heads with an innovative design. The mouth-to-lung coil provides plenty of surface area to increase the flavor of your vapor. Ideal for vaping at low-wattage levels, the heads provide a satisfying experience while allowing you to hold off charging for as long as possible. The included Wismec AMOR NS Sub-Ohm Tank is every bit as smart as the rest of the components of the starter Kit. You can easily refill the 2-milliliter tank from the top, and an airflow ring at the bottom lets you adjust the tightness of your draw. Every part of the tank is removable to allow for easy cleaning. Get the most out of your high-nicotine e-juice with the simple-to-use, compact Wismec CB-60 Box Mod, advanced Wismec MS03 MTL 1.5ohm head and innovative Wismec AMOR NS Sub-Ohm Tank. 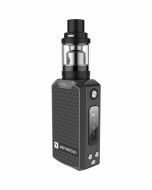 Order the Wismec CB-60 Kit with AMOR NS-2300 Tank today.